Demetrius III was the son of Antiochus VIII Grypus and his wife Tryphaena, and ruled the Seleucid Empire for a very short time in 95 BC. By the assistance of Ptolemy IX of Egypt, he recovered part of Syria in 95 BC, and held his court at Damascus, from where he tried to enlarge his domain. To the south he defeated the Maccabean king Alexander Jannaeus in battle, following a request for assistance by Jewish rebels, but the hostility of the local Jewish population forced him to withdraw. While attempting to dethrone his brother, Philip I Philadelphus, he was defeated by the Arabs and the Parthian Empire, and taken prisoner. 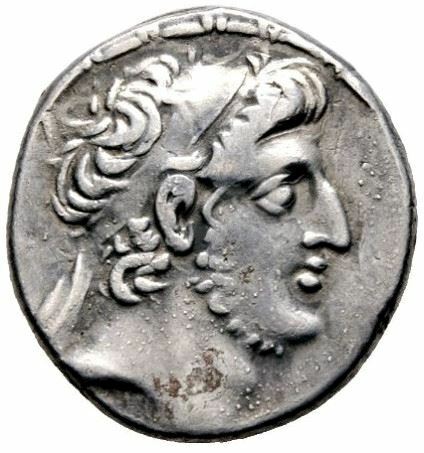 He was kept in confinement in Parthia by Mithridates II until his death in 88.